Two years ago Amezcua had a chance to run again, and to build on her success in the 2008 election. But SAUSD Trustee John Palacio, who now considers himself to be a political consultant, got in the way. He prevented her from running out of fear that she might beat him. There were only two seats up in 2010, Palacio’s and that of his fellow incumbent, Audrey Noji. Palacio ended up keeping everyone out of that race, except for me. I was sickened to see that no Latinos were challenging Noji so I ran and lost by only 1,400 votes, with no campaign budget. Palacio ended up endorsing Noji. Had Amezcua run in 2010 she almost certainly would have won. I think she would have beat Noji for sure. I would have withdrawn and given her a clear path to do so. But she wiffed. 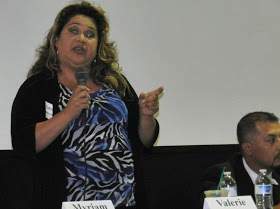 So she ran again this year as part of Palacio’s train wreck “Santa Ana Spring.” And she lost to a Republican – Ceci Iglesias. Once more I withdrew from the race and I ended up supporting Iglesias and incumbent Jose Hernandez. Both of them won. Palacio ran a terrible campaign for Amezcua. They raised a lot of money and spent it but their message was rejected by the voters. The entire Team Benavides idea, which Palacio dreamed up, failed as only two of their cabal members succeeded – Reyna and Council incumbent Vince Sarmiento. The latter spent $70K and barely beat Estela Amezcua, who spent nothing and didn’t campaign. By the way, another Spring candidate who lost was Myriam Tinajero, the sister of Santa Ana Councilman Sal Tinajero. I lined up the endorsement of Mayor Miguel Pulido for her but Sal wouldn’t accept it. She lost badly but could have won if not for being dragged down by the Benavides disaster. Amezcua can run again in two years. Palacio won’t let her. He has been in office now as a SAUSD Trustee since 1998. He supported Measure GG this year, limiting our Mayor to 8 years in office, or four two year terms. But Palacio has now been a Trustee for 14 years. And he will assuredly run again in 2014. I spoke to Cecilia Aguinaga this week and we are planning to launch a school board term limit ballot initiative. I would like to see it not only limit the school board members to two terms but also I hope that it will establish area-specific elections. Palacio, Noji and Hernandez, as well as Rob Richardson, all live in north Santa Ana. The rest of the SAUSD is quite simply not represented. Only Iglesias lives in the heart of the city. And she and Hernandez are the only ones with kids in the SAUSD. Palacio will never stand for change and neither will Amezcua, so we are going to give the people of Santa Ana the chance to make their change. I should note that I am generally not a fan of term limits however for an area-specific ballot measure to pass I believe we will need to include term limits, which are popular with the voters. could anyone really take seriously a candidate who shows up to a forum in ANIMAL PRINT?!?!?! Thats just about as strange as showing up in camo! I thought that was Alfredo in drag. Poor girl. What difference does it make what a person wears, its whats in their heart. If you vote for people because of what they are wearing, you have personal issues. I didn’t know we voted for people based upon their clothing. You need to go back to school and learn why and who we vote for. Rob Richardson has lived in south Santa Ana and I believe he attended Santa Ana High. He did graduate from SA High. But unless he moved after his divorce he lives in my neighborhood, Park Santiago. Did he split up with Vivian. I thought they were “good Catholics”? Fr. Moneypenny must be pissed, maybe thats why he split to Brea! Art, don’t you think it is cruel to go after a man with Down Syndrome? Perhaps you do not know this but Mr Palacio was put on the Santa Ana school board as part of the Make A Wish Foundation. Palacios wish was to serve as a Trustee and his wish was granted. If do not believe me, please post Mr. Palacio’s photo. Shame on you Mr. Pedroza for being unkind to the Handicapible. He won fair and square. But he will be ousted in two years. Valerie shops at Fallas Paredes. It’s all they had in her size (2X). Hernandez lives in South Santa Ana. Great guy. I endorsed him and am glad he won. Hernandez and Noji are neighbors. Hey Chicano Power. What’s up with you picking on your own Raza? I heard through the Santa Ana grapevine that Rob Richardson is pooping his pants now and need to wear Depends. If it’s true, that’s too bad. I guess his multiple sclerosis is getting pretty bad. I hope his new wife knew what she got into when she married Richardson. Yes Mr. Richardson has M.S. and has learned to live with it. Yes, John Palacio was born with Down syndrome but it has been in remission for nearly 3 years. Both men have given much to the children of Santa Ana and we should applaud their service.